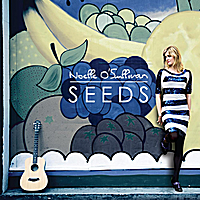 A beautifully crafted debut album with overtures of jazz from Irish singer-songwriter Noelle O'Sullivan. Blissful musicianship and evocative lyrics brought to you through lush vocals drizzled with a folk mist. Hello and welcome to a slice of my world! I love writing and singing songs – they are a reflection of who I am and how I see things around me. Life can be so fast-paced with fleeting moments, that I long to capture them and express them through song. Writing grounds me and brings me into the moment- it’s a way of honouring my feelings along with the time that I have on this earth. I am amazed at how quickly time goes by and know how easy it is to get caught up in the flurry of things. Being creative brings joy and healing into my life. I can attribute my initial love for music and song to my father who comes from the village of Glin in West Limerick, Ireland. He learned to play the fiddle by ear from his father and picked up traditional Irish songs wherever he went. His love of music is what inspired me and gave me the confidence to sing. I will always carry that inspiration with me. I hope you enjoy the album and I look forward to hearing your comments.